WWII wasn’t the first war to have enemy combatant’s dressed as civilians. But it is the war we seem to most associate with covert weapons and spies. The problem for agents and spies is a weapon found on your person discredits your claim that you’re something harmless and can be ignored. Yet having a last resort weapon could be the difference between torture then death and escape. OSS and later the CIA developed little hideaway last resort tools for their agents as did many other domestic and foreign agencies. We are fascinated by the James Bond devices. Agents tied a small cord around the metal to provide them with a loop and more friction surface. 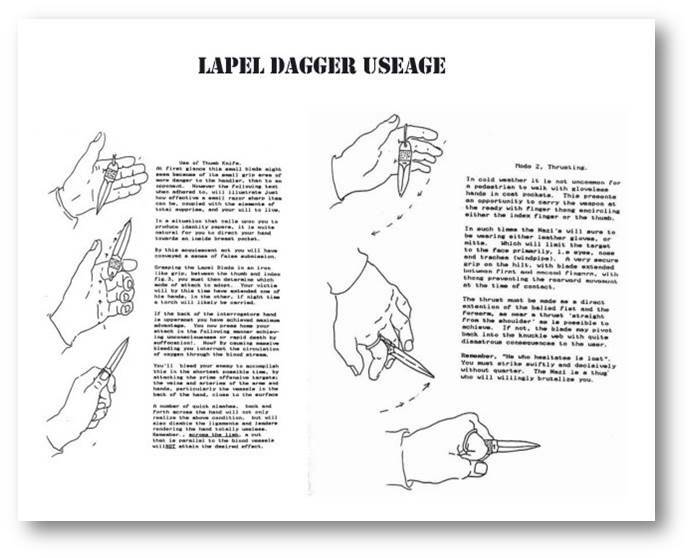 There probably isn’t anything more fascinating then the OSS “lapel dagger.” It was just a small thumb-size flat piece of sharpened steel that could be sewn behind lapels, inside pockets, or just about any place. Two: sew it where arresting officers would expect you to place your hands in response to their orders. I had always wanted an authentic one, but twenty years ago A.G. Russell came out with their version of a undetectable lapel dagger. It is about 3.75 inches long with a 2.5 inch double sided blade. It’s made of plastic and frankly, I don’t think it would survive more than a couple quick stabs before the blade snapped. But that’s all you might need to get your feet under you and escape. It came with two plastic sheaths so you could move the dagger between coat and another location. One can almost see Bond moving it from his suit coat to his pants pocket unnoticed. Each sheath has small holes to facilitate sewing. At the time Russell also came out with a dagger shaped like their Sting but made from nylon filled with glass fiber. It was advertised as a CIA letter opener. I remember the claim that you could resharpen it with a coarse file. The knife is about 6.75 inches long with a 3.25 inch blade and 3.5 inch handle. It is substantially sturdier than the lapel knife. Both of these were on sale during the very early days of metal detectors at airports. At this time you could carry a smallish knife like a Spyderco Delica through security. You declared the knives by placing them in a small basket with your wallet which bypassed security. There was often some question about partially serrated edges, but most of the time the knife passed and you carried it on the plane. Don’t even think about it today! But at this time they are out of stock. Cold Steel makes a variety of plastic knives that are almost undetectable. They used to come with removable metal rings to ensure they could be seen when x-rayed. They may have simply given up on the pretense of detectability and saved the customer the problem of removing the metal rings. Lansky also makes a very passable plastic dagger they promote as a box or letter opener.